The Projects section of your LinkedIn profile is the perfect place to spotlight your involvement in company-driven initiatives. Long-range, high-yield projects that deserve a bigger spotlight than a simple bullet in your Experience section belong in the Projects section. Choose projects that make you proud and show that you helped move the corporate needle, but most of all, choose projects that will impress your target reader. The Projects section is also the perfect section for consultants who have spent time working with different clients. Consultants can’t list clients in their Experience section because they didn’t work for them directly as an employee. The Projects section is the perfect answer to this conundrum. This section also allows you to add a URL that links to an external website to add even more context to the project. Another great part of this section is that you can pull in other team members and link them to the project to show the full range of contribution. If you have the Projects section already added to your profile, simply scroll to it and click the pencil (edit) icon to enter into edit mode, then go to Step 5. If you don’t have the Projects section added to your profile yet, scroll below the Contact Information section at the top part of your profile. Two sections appear that you can add. If Projects isn’t one of the options listed, click the View More link to expand the area and see a full list of sections to add. In the Project section, click Add Projects. When clicked, the Projects section appears on your profile. In the Name field, enter the name of the project. 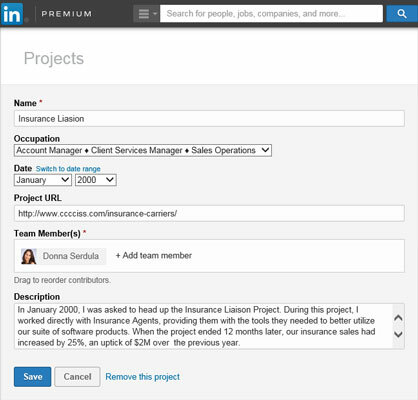 In the Occupation field, select the current or prior experience to connect the project to a particular role. The drop-down list is populated by your current and previous experiences. By linking the project to a position, the project shows up in the Projects section and directly under the position it is paired with. In the Date field, choose the month and year you worked on the project from the drop-down lists. If this project spanned a period of time, click Switch to Date Range to add an end date. In the Project URL field, add the website where more information on this project can be found. If this project doesn’t have a web presence, skip this section. In the Team Member(s) field, place your cursor over +Add Team Member and start typing a name. If the team member is one of your first-degree connections on LinkedIn, his or her name appears in a drop-down list. Select the team member(s) you wish to add to the project from the drop-down list. You can add team members even if they aren’t on LinkedIn, but they will not have profiles dynamically linked within the project. In the Description field, add context around your project so that your reader has an idea of the extent of your success and why this project was singled out. Adding a project to the Projects section. Just as you can add a person to a project you created, others can add you to a project they created. If you aren’t happy with your inclusion on a project on someone else’s profile, you can’t remove it yourself. You must reach out to the person and ask them to remove you from the project.